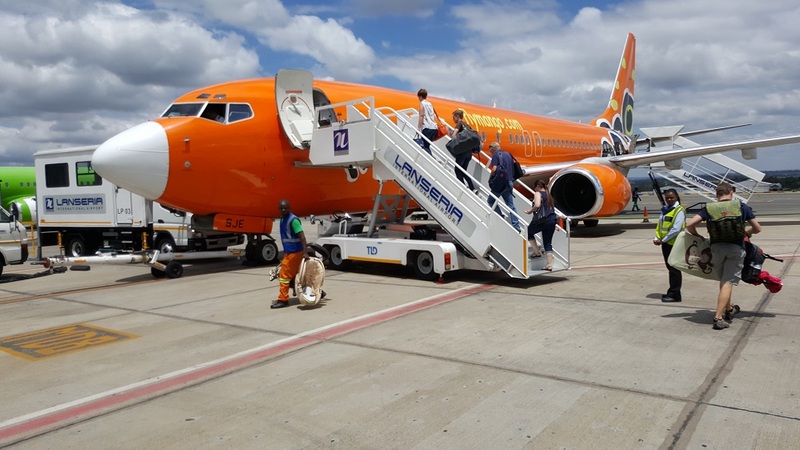 Mango Airlines offers a quality service offered at low rates to travellers who want to fly from Cape Town to any of the major airports in South Africa. This includes Johannesburg (OR Tambo International Airport and Lanseria International Airport), Bloemfontein Airport, Durban's King Shaka International Airport and Port Elizabeth. (17 May 2017), from both Durban and Bloemfontein; and including return flights on Mango, a standing ticket at the concert, a night's stay at the Portswood Hotel, and a day's car hire. The price is from R3990* from Bloemfontein, and from R3540* from Durban (*may change). Seeing bright orange aircraft soaring high above the cityscapes has become a common site, though initially the vibrant shade of orange came as a shock to the local public. Mango Airlines makes provisions for special needs guests with specific medical requirements. The traveller should inform the booking agent of their medical requirements and ensure that they confirm their booking 48-hours in advance. Disabled guests should be accompanied by during a flight to ensure that they have assistance should any emergency flight procedures be executed. Mango are the only airline in South Africa offering a wifi-connection for you to send that whatssap whilst up in the sky. Children aged between seven days and 24-months of age may be seated upon an adult’s lap during the flight, but after the age of two years they will require their own seat. Infant twins must be supervised by two adults and travellers with lap children may not be seated in emergency exit rows. It is advisable that you arrive for check in anywhere between 1.5 to 2 hours prior to your scheduled departure time. You should also note that the deadline for check-in is 40 minutes prior to flight departure and all baggage should be checked in by this time. The boarding gates are closed 30 minutes prior to flight departure, which gives passengers plenty of time to settle in for their flight. Food and beverages are served on board and guests can enjoy a tasty selection of delicious snacks and drinks. You could enjoy a tasty, fresh bagel with spicy beef, mozzarella and mustard or you could opt for a delicious ciabatta with mixed spicy peppers and cream cheese. Drinks range from fruit juice, soft drinks to bottled water and tea or coffee, with a range of alcoholic beverages and savoury snacks like peanuts available. Beer, brandy, vodka, gin, whisky, ciders and a range of red wines are available for your refreshment on flyMango flights . An assortment of crisps, delicious freshly baked muffins, tasty chocolates and soft jelly sweets are also available to tempt your taste buds. While winging your way swiftly to your destination you can enjoy a cup of hot Milo or can savour the refreshment of a glass of chilled, bubbly dry lemon. You will arrive at your destination (usually) on time and refreshed, ready to conquer the world!